Real GDP growth in the first quarter was weaker than expected (0.2% vs. 1.0%), but it wasn't much of a surprise. It's now been almost six years that the economy has managed only meager growth—about 2 ¼% per year on average. As a result, by my calculations, real GDP is a little over 10% below its long-term trend potential. That's more than $2 trillion in lost income every year, and it's getting worse. Weak quarters happen from time to time, as the chart above demonstrates. First quarter growth this year was negatively impacted by West coast port strikes (which reduced exports), terrible weather, and fallout from a sharp cutback in oil drilling activity. Nevertheless, we'll most likely see a pretty decent rebound in the current quarter, much as we did last year, as those temporary factors disappear. 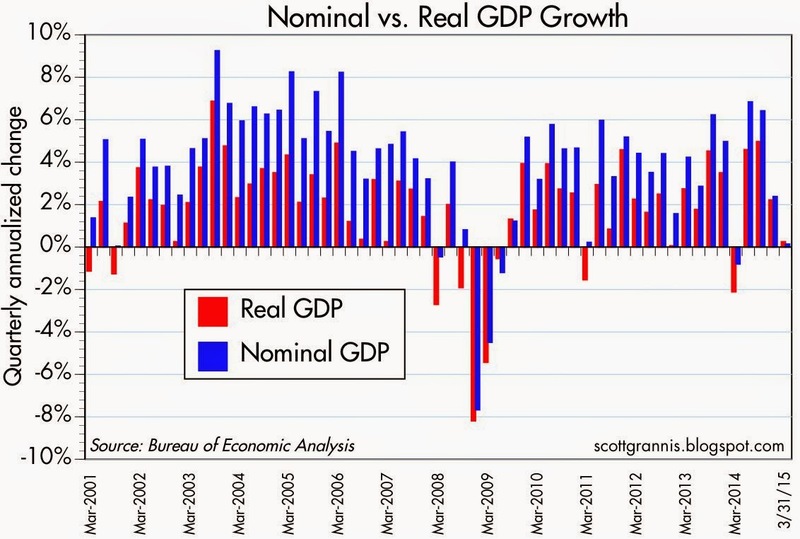 The chart above shows the 2-yr annualized rate of real GDP growth, in order to abstract from quarter-to-quarter volatility. By this measure, the economy looks to be growing about 2.5% per year. Since the recovery began in mid-2009, the economy has posted annualized growth of about 2.25%. 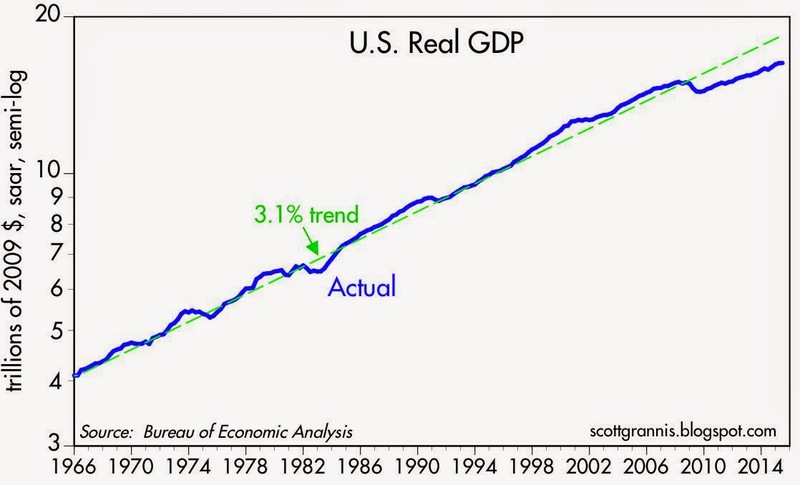 The chart above compares the level of real GDP to a long-term trend growth rate of 3.1%. This confirms once again that we are stuck in the slowest recovery ever. It's my belief that the persistence of slow growth is largely the result of bad policies, though demographics likely plays a part too. Corporate profits have been very strong, but business investment has been very weak. Without new investment and risk-taking, we are not going to see a pickup in productivity which is, at the end of the day, what drives stronger growth and higher living standards. Investment has been weak probably because marginal tax rates and regulatory burdens have increased significantly in the past six years. In a sense, and expansion of government has suffocated the private sector. Things are not going to change much for the better until policies become more pro-growth. Whether the persistence of relatively weak growth is a reason for the Fed to continue to keep short-term interest rates extraordinarily low is one of the key questions of our time. I don't see how low interest rates stimulate investment or enhance productivity. Only private initiatives can do that. On the bright side, if policies do become more favorable, there is tremendous upside potential to look forward to. Closing the GDP gap would be nothing short of exhilarating. I wholeheartedly agree. There is plenty of speculation going on but little investment. Both individuals and institutions are chasing yield in a very low yield environment. In some cases this will end in disaster. Non public, private investment through non-bank lenders and investors is becoming very aggressive. The sooner the Fed raises rates so that more secure investments provide an adequate yield the better. Part of the gap is due to the disconnect between what the economy from its citizens and what its citizens are capable of. For growth we need productive citizens but they haven't worked to get productive through education and work habits. This deficit is from our African-American community and years of college students taking 'touchy-feely' courses. At least in the latter I sense that this is coming to an end and college students now are worried about how they will support themselves. With regards to African-Americans sadly it's a lost cause for the next 50 years and they are 13% of the population and truth be told a burden on the 87% left. Germany's employment rate has increased to 75 percent from 65 percent 12 years ago. They made it more attractive to work and less attractive to not work. In the United States we have 12 million people collecting "disability" from SSDA or the VA. Even so, no industry appears to be swamped with demand. The Fed needs to gun the presses. If you know of an industry that will be persistently unable to meet demand, please tell us. I would like to invest in an ETF in that industry. What will higher rates do to the value of my bond portfolio? What will higher rates due to the value of my stock portfolio? What will higher rates do to the value of my property portfolio? 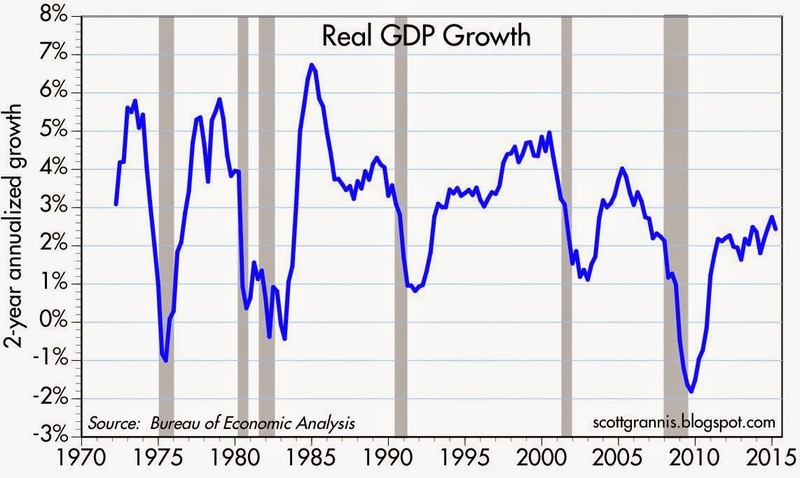 when you look at GDP growth Vs is historical trend and consider the stock market at lofty levels driven largely by forced low interest rates by the fed and corporate buybacks which undermine investment, you must conclude that this is a dicey market. Re: stock market valuation. Don't forget that corporate profits are at all-time record highs, yet PE ratios are only slightly above average. The market is not cheap, but it's not obviously way overpriced. inflation everywhere is not an immediate problem, no country or bloc wants a high currency so rates and risk free returns are likely to stay low pushing up the price of dividends. Im looking at the Fred Fed chart, and seeing that Net and Gross Business Investment looks like it's had the steepest 5 year increase in decades. Am I reading this wrong?? Business investment has indeed increased dramatically since the recession, but relative to GDP and to past levels of investment, it's not very impressive. For example, in real terms, capital goods orders today are still 20% below their 2000 peak. Business fixed investment relative to GDP is now 16%, whereas it was about 19% in 2000. I wonder if the Fed has painted itself into a corner. We will have another recession, and we do not know when. If we have another recession, the Fed is already at zero interest rates. The Fed will have to copy various European nations and Japan and go to negative interest rates. Reintroducing QE before the next recession may actually be a sensible monetary policy tool. This is certainly not a "normal" recovery from a "typical" recession. Unusual factors are involved this time. Scott Grannis: Got it. Thank you for the clarification.